Like the family crest implies, the Cecchi’s have been crafting wine since the late1800’s, yet this notable Tuscan producer inexplicably avoids the attention it deserves. Like many prominent Italian producers such as Gaja, Allegrini, Mazzei and Antinori, the Cecchi family owns a constellation of independent wine estates throughout Tuscany. Guiding the helm of this ship are the Cecchi brothers, Cesare and Andrea. Recently, I had the good fortune to sit down with winemaker Andrea Cecchi over dinner and taste through many of his wines. 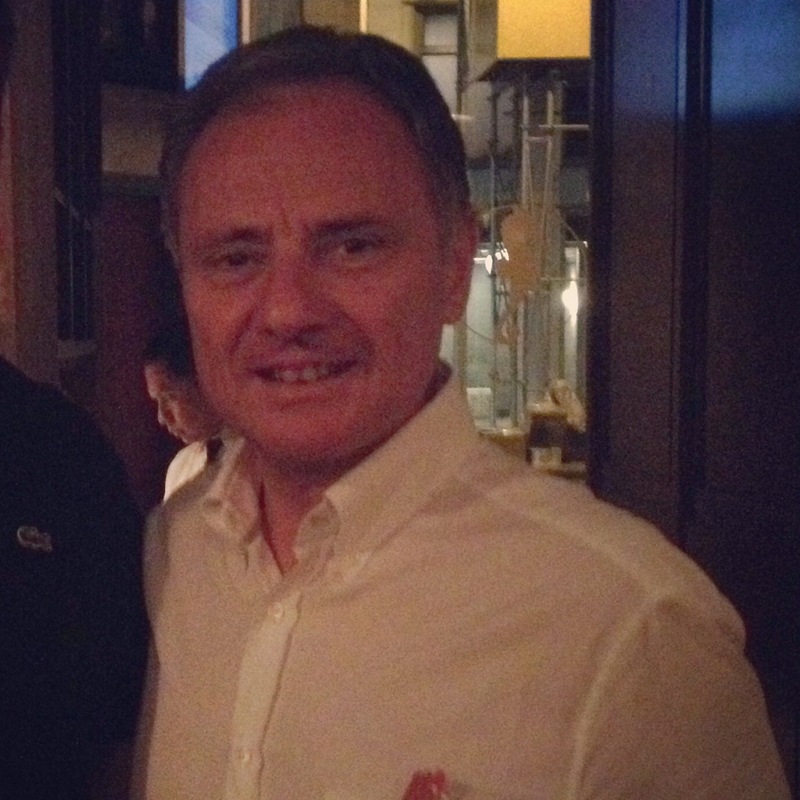 Andrea Cecchi is a generous man with an amiable nature. He’s eager to talk about his family history and just as quick to ask questions of his companions; always seemingly searching for knowledge as to how his wines are perceived and in what context they are enjoyed. Of average build, but with a certain quiet calmness about him, he is simultaneously commanding and disarming. 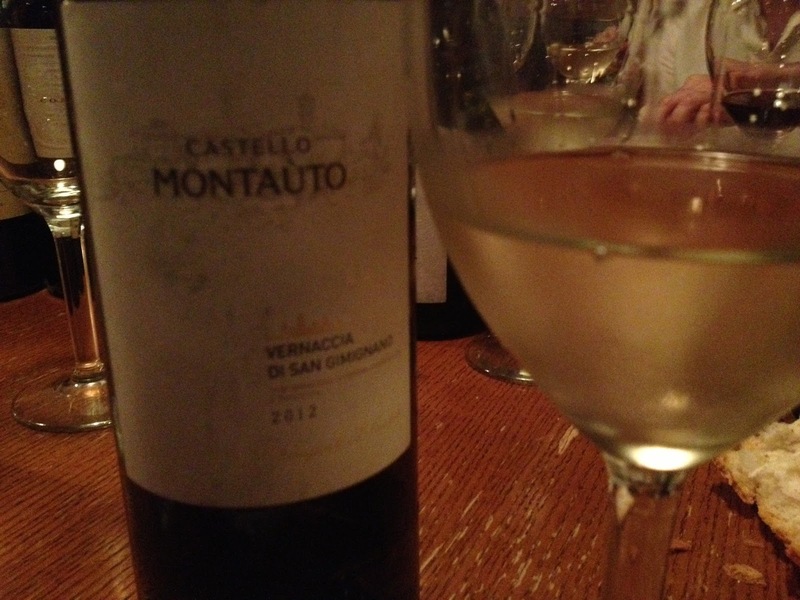 The evening began with a pleasing white from the Cecchi estate near San Gimignano, Castello Montauto. Enduringly connected to San Gimignano, the Cecchi’s wanted to pay homage by creating a profoundly territorial wine. They have succeeded with the 2012 Vernaccia di San Gimignano. Comprised of 90% Vernaccia with 10% miscellaneous grapes completing the blend, the 2012 is nearly clear – a very pale golden color. On the nose, the wine exhibits pretty notes of Tuscan hay, minerals and lemons. Light and crisp on the palate, the flavors add notes of grapefruit to the shaley mineral texture of the wine. Fermented completely in stainless steel and then refined in bottle 4 months prior to release, the wine retains all the freshness from the vintage. Very nice. 87 points. As I spoke to him, one of the things that struck me was the breadth of Andrea’s knowledge about all of the estate wines. It’s obvious that he cannot divide himself into pieces to run harvests and craft wines simultaneously in all corners of Tuscany. 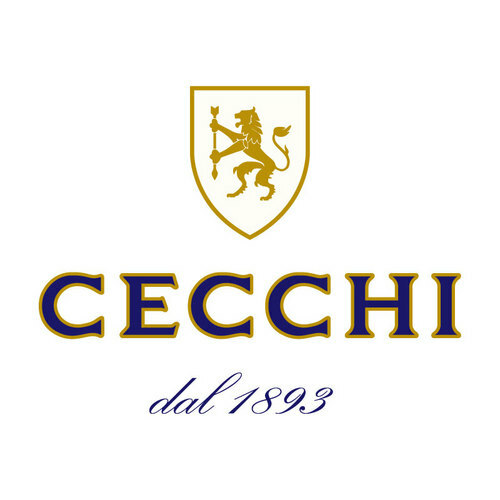 Cecchi himself crafts the wines from Villa Cerna, the family estate at Castellina in Chianti as well as the wines that bear the “Cecchi” moniker. 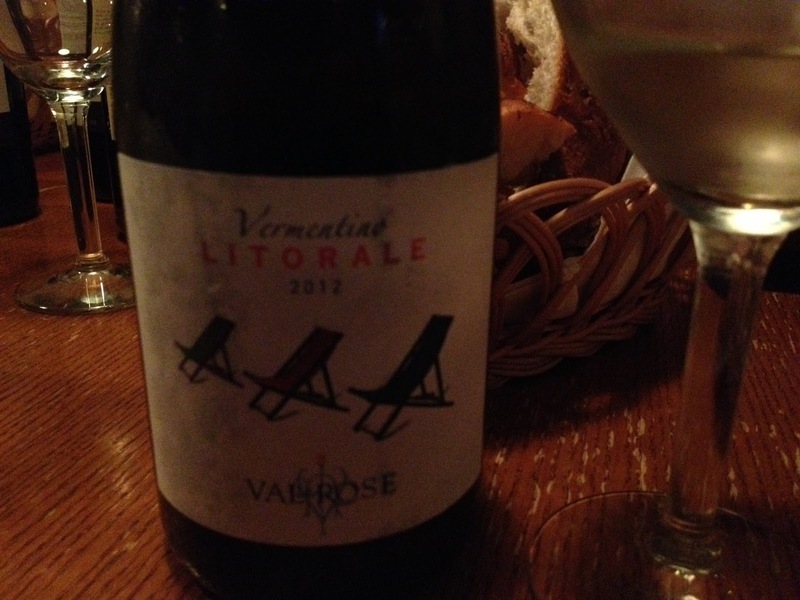 The next wine presented was the 2012 “Litorale”, a Vermentino blend from the Val delle Rose estate in Maremma. This medium golden wine is 85% Vermentino and 15% other white grapes. From the “Valley of the Roses” estate in Maremma, this wine is kissed by the proximity to the sea and the terroir is evident. There’s more going on here than with Monsauto’s Vernaccia. The aromas are assertive, with lemon, white stone fruit, and an aqualine minerality. On the palate, there’s an almost briny salinity to the wine that is very attractive – and mouthwatering. The crisp lemon character is accented with lots of dusty, shaley mineral – reminiscent of the crushed sea shell fossils that are ingredients to the soil here. This wine would be perfect with a seafood risotto. I really like it. 89 points. 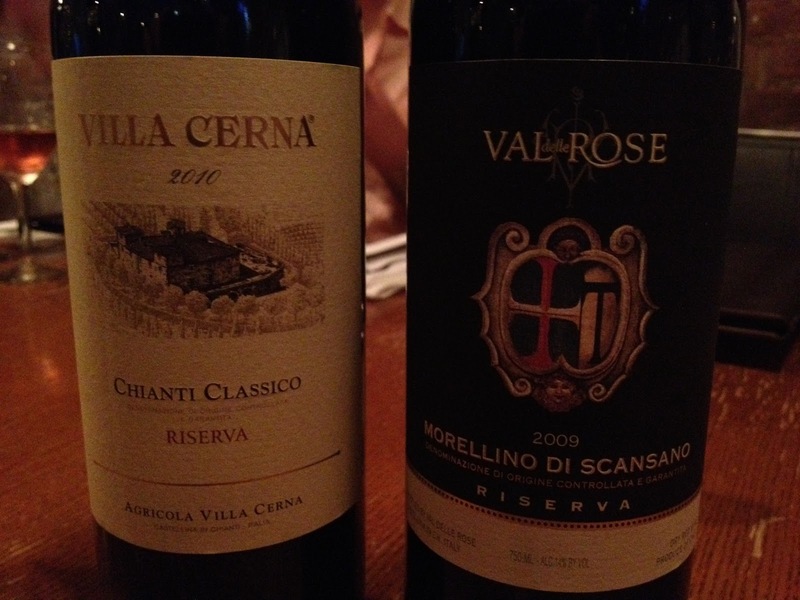 The Val delle Rose estate contributed the next wine as well, and it was a standout. 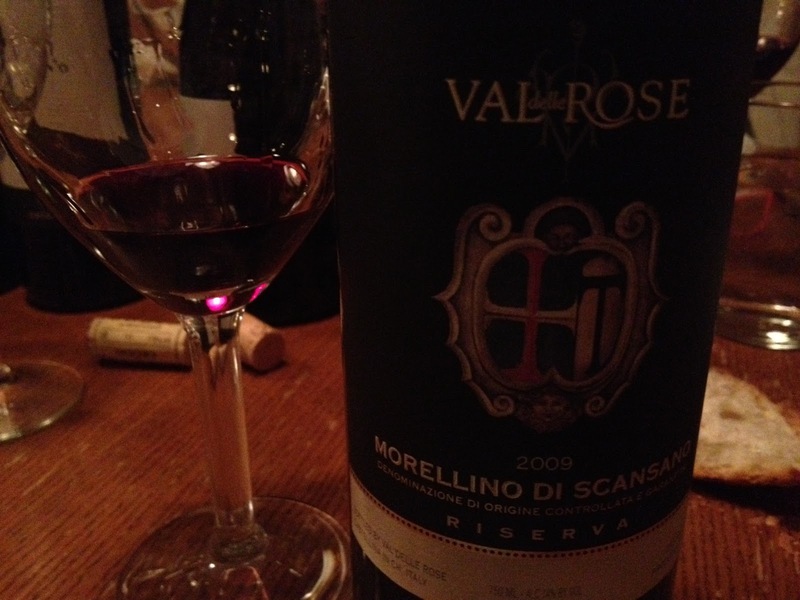 The 2009 Morellino di Scansano Riserva gives up nothing in a room of it’s peers. This deep, dark crimson wine is 90% Morellino (Sangiovese) and 10% Merlot. Morellino is the local name for the clone of Sangiovese grown in Maremma. The estate grown fruit explodes on the nose with deep cherry aromas along with brined olives, pipe tobacco and suede. On the palate the wine is full bodied with intense flavors of berries, cherry, leather and slight vanilla spice, this is well rounded and serious. Acids and tannins are ample but balanced. This is beautiful and one of the best Morellino I’ve ever had. Fermented in stainless steel and then aged 12 months in French barrique prior to release. Paired perfectly with cheeses, cured meats, braised vegetables and various pastas. 91 points. The remaining wines tasted were crafted directly at the hands of Andrea. The Villa Cerna estate lies in the heart of Castellina in Chianti. The site is prime and the grapes it creates are soulful and display the nature that “farmer” Andrea wants to make “winemaker” Andrea’s job all the easier. 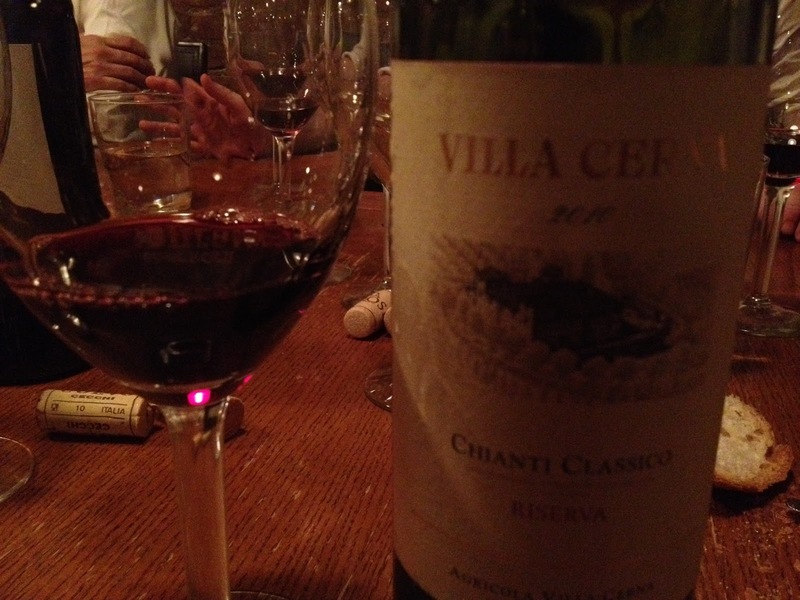 The 2010 Villa Cerna Chianti Classico Riserva is a deep garnet with violet overtones to the color. A blend of 95% Sangiovese and 5% Colorino, this rosso is very expressive on the nose. Flowers, dried herbs, cured meat and cherries are prominent and mingle harmoniously. On the palate, the wine is medium to full bodied with a juicy, vibrant mouthfeel. The tannins, acids and alcohol are in near perfect balance. Cherries laced with tobacco and dried flowers are the perfect accompaniment to the braised rabbit stew this was served with. Absolutely typical and delicious. Fermented in stainless steel and then aged for 18 months in a combination of barrique and large botte – then a further refinement in bottle for at least 10 months before release. 91 points. This dinner was organized as part of the “Winemaker’s Coevo Tour”. Coevo is Cecchi’s flagship wine, the pinnacle of Andrea’s vision and prowess and his interpretation of the contemporary greatness of Tuscany. What does that mean, I asked him? Coevo means “Contemporary” in Italian. Tuscan wine quality has never been greater and I wanted to create a wine that would capture this spirit. Coevo represents two of the great regions in Tuscany: Chianti Classico and Maremma. The grapes for Coevo come from our Villa Cerna and Val delle Rose estates and by combining these two terroir, we create a wine that has a contemporary representation of that specific vintage across Tuscany. In this regard, as I did some background leading up this dinner, I noticed that the blend for Coevo has changed slightly with each vintage produced. Why is that? 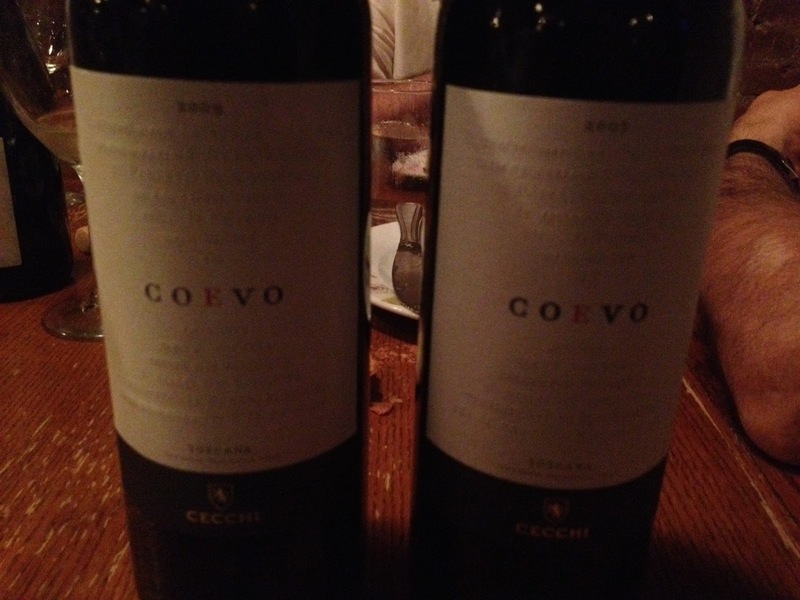 I had the fortune of tasting the two most recent vintages of Cecchi’s Coevo, 2007 & 2009. The 2006, which received the coveted “Tre Bicchieri” distinction from Gambero Rosso, was unfortunately not available for tasting. 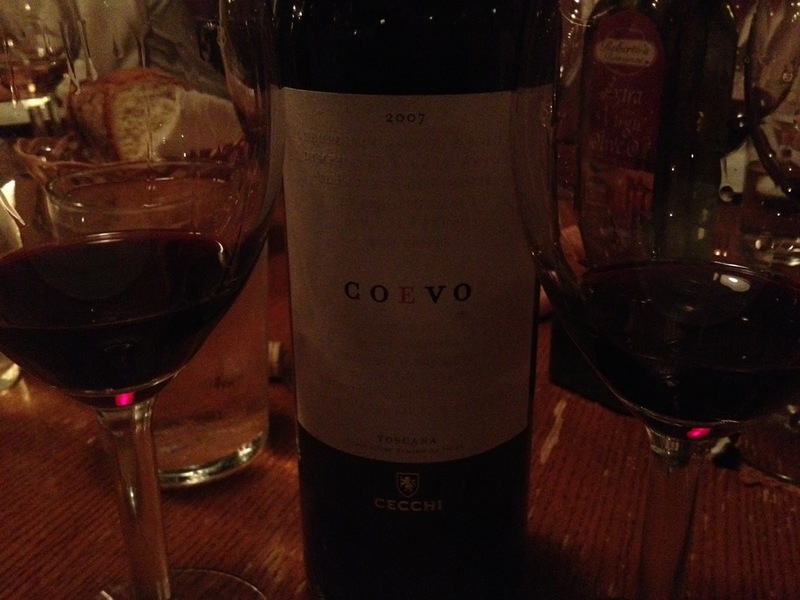 The 2007 Coevo is a blend of 60% Sangiovese, 15% Merlot, 15% Petit Verdot and 10% Cabernet. The Sangiovese and Cabernet are grown on the Villa Cerna estate in Castellina, while the Merlot and Petit Verdot are grown at Val delle Rose in Maremma. Fermentation takes place in stainless steel, while oak aging varies by the individual grapes. Varietals are aged in a combination of barrique and large tonneaux for 12 months. In the glass, the wine is a dark, blackish red. It’s nearly opaque. On the nose, the aromas appear tightly wound but with some aeration, cherries, leather and smoke are noticeable. On the palate, the wine exhibits a deep core of ripe cherry fruit with fresh herbs, leather and mineral in a supporting role. This is tight and reserved now and is almost reluctantly agreeing to express what it has – like a teenager just stirred from sleep. Still, there is power and complexity lurking beneath. Cellar this. 91 points. This Coevo is a dark, black, vibrant purple. Gorgeous to look at. Everything is here in this wine! The Sangiovese is dominating the nose at the moment with freshly cut flowers, dried herbs, mushrooms and spices. There are hints of dust, shale and mineral as well. On the palate the wine is viscous and fruit driven. The spice and cherry of the Sangiovese is seemingly enveloped by the texture of the Merlot. This is so much more open and expressive than it’s older sibling. With air, the black fruits from the Cabernet began to emerge more. This was a “wow” wine. 95 points. As dinner progressed, we enjoyed conversation, remaining food, and sampled whatever wines were left. Before breaking up, I asked Andrea if there was going to be a 2010 Coevo and what he thought of that vintage? Of course. 2010 was excellent, in fact, it is probably the best vintage for Coevo yet and also the best vintage in the first decade of the 2000’s. If I have to say it, I’ll make it official: Put these wines on your radar! Next time i am at a wine bar I will look for this wine sounds delicious.